Swiss International Air Lines (SWISS) is to put its first Bombardier C Series aircraft – a CS100 – into service on 15 July. In doing so, SWISS will be the first airline in the world to operate the new Bombardier C Series. The flights concerned are bookable on swiss.com from today. The innovative short- and medium-haul twinjet sets new benchmarks in inflight comfort, operating economics and environmental terms, including a 50% noise reduction which will particularly benefit local airportresidents. The arrival of the C Series will also create 150 new jobs at SWISS. SWISS expects to take delivery of its first Bombardier C Series aircraft – a CS100 – as scheduled at the end of June. And on Friday 15 July the aircraft will take off from Zurich at 12:30 on its first commercial flight: LX 638 to Paris (Charles de Gaulle). The commencement of scheduled operations with the innovative new Bombardier twinjet will mark a further milestone in SWISS history, following the successful service entry of the Boeing 777-300ER. In addition to Paris (Charles de Gaulle), Manchester, Prague and Budapest will also be among the first SWISS destinations to receive Bombardier CS100 service. They will be followed by Warsaw and Brussels at the end of August, and by Nice, Stuttgart, Hanover, Milan, Florence and Bucharest in September. And more and more destinations currently served with the Avro RJ100 will gradually be switched to C Series operation as the new twinjets arrive. The Zurich-London City route is expected to have C Series service from the first quarter of 2017. 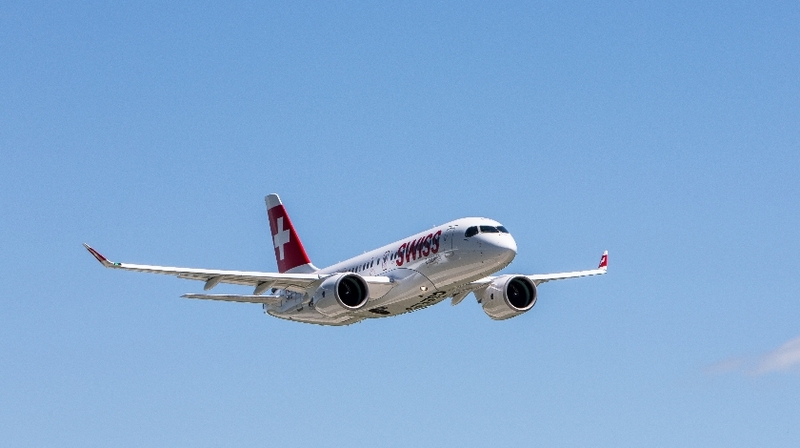 The first SWISS flights to be operated with the new Bombardier C Series will be published on swiss.com and all further booking platforms in the course of this morning. SWISS expressly points out, however, that the operation of a particular aircraft type on a particular flight can never be guaranteed, as short-notice equipment changes are always possible for operational reasons. SWISS will be the first operator in the world of the C Series, Bombardier’s entirely newly developed short- and medium-haul aircraft. With its state-of-the-art engine, systems and materials technology, the C Series sets new benchmarks in inflight comfort, operating economics and environmental terms. The new twinjet is only about half as loud as comparable aircraft to the human ear. It also consumes up to 25% less fuel and, as a result, will reduce SWISS’s annual carbon dioxide emissions by some 90,000 tonnes. The arrival of the new Bombardier C Series in SWISS’s European fleet will further create some 150 new positions within the company’s cabin crew corps.